I have now down multiple app download and play and complete challenge type offers straight from the app to get tokens. I have now had to fight and “prove” I complete the offers each and every time and gotten no tokens. I wasted hours playing games I don’t give a crap about to get tokens because this app is too outpriced and they refuse to give tokens for completed offers. Even with screenshots and exact dates and times of download and completions the decline. Easy way to force people to pay money! What a rip off. One night me and my friends were having a sleepover so we called our friend who didn’t respond. It left a voicemail which It never seemed to do and then It scared the mom and he cops got involved. All I’m saying is be really careful who you call and what you do on here. I learned my lesson.. just be careful, what seems like a fun harmless joke can be blown out proportion very easily and end up being a mess unwanted by everyone. Other than that the app is good and funny if you take many precautions. Make sure to keep the message saying t is a prank at the end to prevent people from being scared. 3/5 due to good quality app just a bad experience. Alright Alright Alright. It’s Boo.Blitz BTW on YouTube. So ummm this app is way WAY to limited and if you’re not willing to spend some money you got to find another app. Downloaded this app last night The entire family was laughing Please add more to the app. How many credits can you earn watching videos is it unlimited? Would you consider adding a feature to where you could keep one of your purchased numbers for more than seven days? I pranked so many people in the phone but always laughed now someone does it for you and you can even Customize the prank PrankDial is awesome and left me awestruck so please buy the app!!! I spent $10 on the tokens so I can do extra things but they sucked up all my money and charged my bill but I didn’t get the tokens. Best prank call app ever. This is the most fun and halirious app. When I prank call people I can't hear them. Good app. But 4 ads for one call? Nope. Maybe 2 or 1, but not 4. The 3 free calls doesn’t work unless you use your personal number. So funny love it ! It’s a really good app😀!! 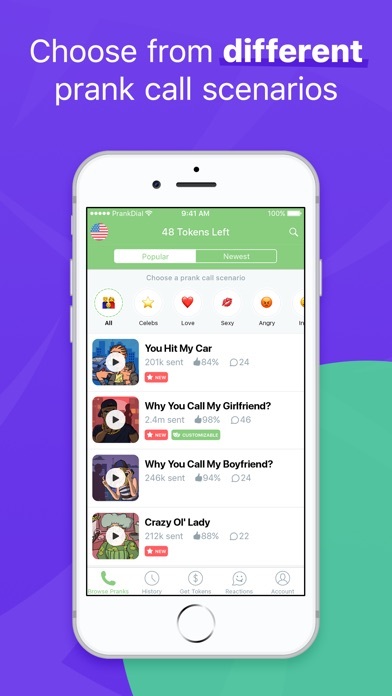 But the tokens are just a bit annoying, I get that you have to pay for the calls but maybe could you make it a bit easier to earn tokens? You could make some pranks cost money? And also the calls are obviously fake😕. But the app is still really funny! You could also make a voice changer thing that costs tokens! Amazing app! You can’t change your number like you used to be able to do. Now you have to download an app and pay money to do it. The other reason why it’s a little bad is because I’m experiencing a glitch where I can’t hear anything on the call, but besides all that , it’s hilarious and fun to use. Customize it!! I can’t stop laughing I haven't laughed so hard in forever!!! I love this app though I can’t use it. It’s kinda cool I can listen to other pranks but when will this be available for Maldives also I am gonna rate this one star hoping it would get developers attention although it’s actually five xD. Most of the people I have tried to prank with this hang up within a few seconds. The pre-recorded calls sound too much like generic spam calls. I got the app used my free call.Paid for more call then the app shouts down.wow how do they do it? 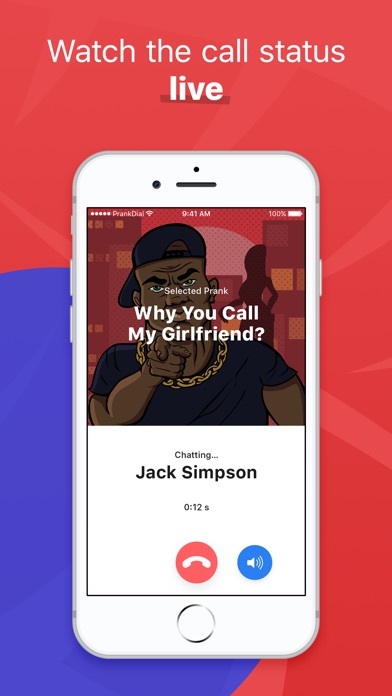 This app is so hilarious, my friends know it’s me, but the reactions are hilarious I would completely recommend this app to anyone who likes to joke around with prank calls. Me and one of my girl friends just pranked one of our guy friends. It was absolutely hilarious!!!! This to me is the best prank calling app ever.The options are crazy.And the recordings are very funny. Can’t use a fake number?!! I absolutely love this app but the whole point of this pranking app is to prank people right? You can’t use a fake number! So you want me to prank call people with my number?! That makes this app useless then. That’s a pretty vital part! Don’t download doesn’t let you enter in a fake number unless you download anotherapplication. This app is trash if your gonna prank call someone why make them used their own number this don’t make any sense.. I’m so disappointed. Used to joke around with this app back in the day & just got it again for fun. 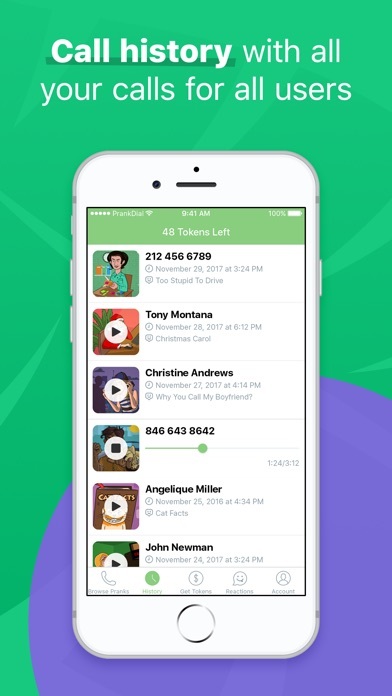 Makes you watch four commercial videos before you can send a call & it comes from your number now. The person didn’t answer & immediately called me back. Harassment calls with no opt out. 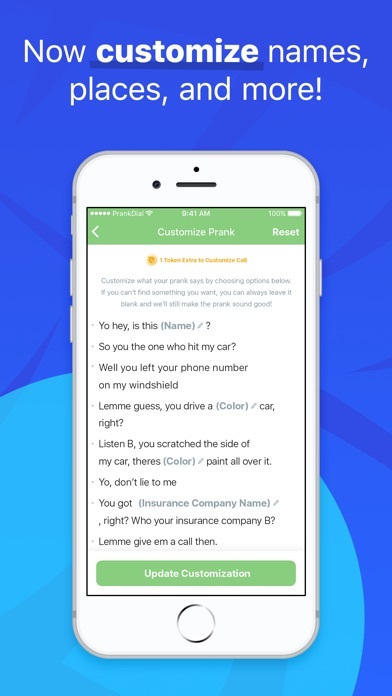 This is the best prank call app in the world.i got my friends and my family members with it. I love this app it’s the best !! If you love pranking people this is the perfect app for you. People actually believe it's a real person and you can customize it to say their name! 100% recommend!